A few weeks ago @raishimi read my article on the disappearing art of handwriting and mentioned that she sometimes includes origami gifts with letters. It was such a wonderful idea, I decided to have a go myself. I spent £15 on a simple guide and a small stack of origami paper in bright hues. My favourites were the squares in sugar pink and bruised plum. I took my time choosing the paper for each design. There is a sensuality about origami paper, smooth to the touch, interspersed with foils. I didn’t know much at all about origami until recently. As paper degrades quickly it has been difficult to establish where origami originated. Japanese origami came into being after Buddhist monks brought paper to Japan in the sixth century. Paper folding traditions seem to have sprung up independently in Europe and East Asia. Paper was so expensive that origami was used only in religious ceremonies. In China for example, traditional funerals include burning folded paper, usually representations of gold nuggets. In Japan, Samurai warriors are known to have exchanged gifts adorned with noshi, a good luck token made of folded paper. Origami stories in Japanese culture include Abe no Seimei making a paper bird and it coming to life. 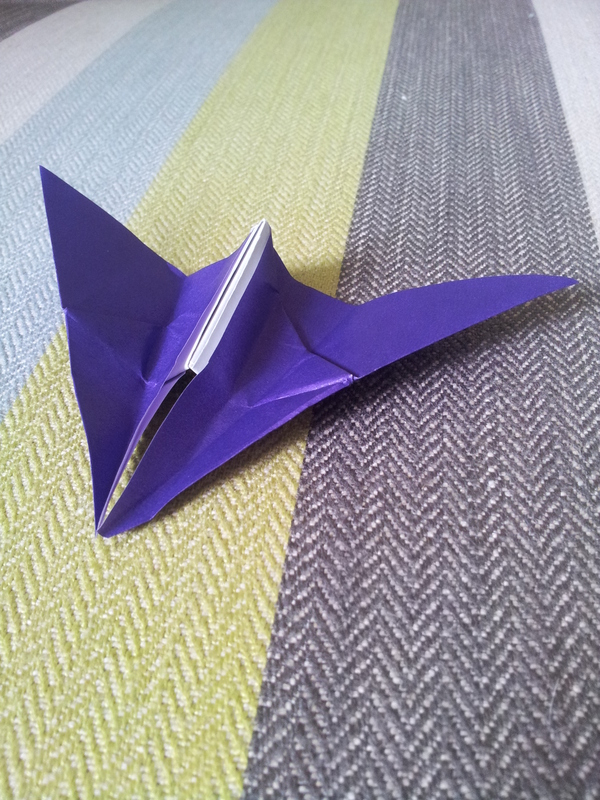 Perhaps the most famous Japanese origami design is the crane, which symbolises peace. The crane also entered popular imagination through Sadako Sasaki’s story, who was exposed to the radiation in Hiroshima when she was an infant and died of leukaemia a decade later. Japanese legend that says that if you fold a thousand paper cranes, your deepest desire will come true. Sadako managed to fold six hundred and forty-four cranes. Today, a statue of her stands in Hiroshima Peace Park. Wreaths of cranes are left there in her honour. Some modern origami artists have been influenced by Bauhaus design. Designs by the most gifted artists today have moved away from linear design and experiment with materials other than paper and foil. As for me, even the simplest origami designs were harder to follow than I had expected. It turns out origami is all about symmetry, dexterity and focus. It teaches patience. I had trouble finding my inner zen while I was folding and pinching the paper. I’m not much of a linear thinker. I left blunt edges where there should have been crisp folds. I manipulated the paper so that stems and limbs went awry. Still, I thought you might like to see my first attempts. 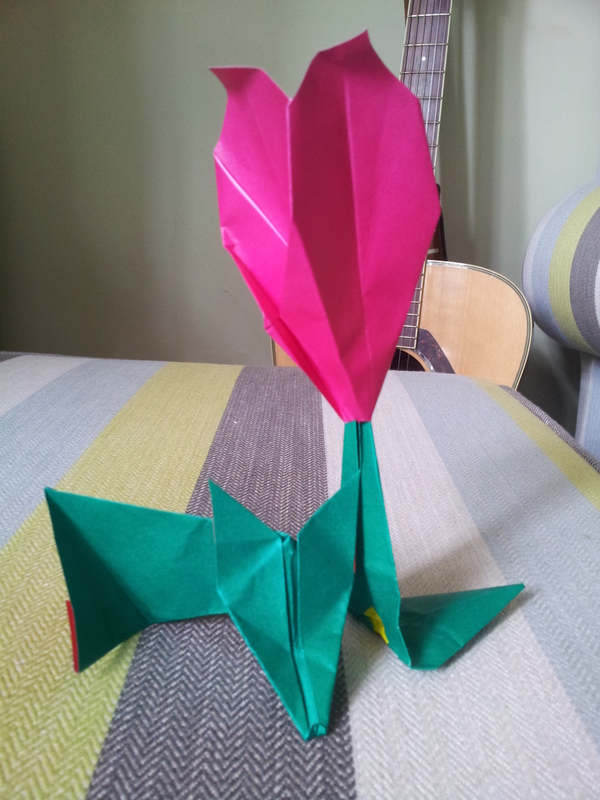 I made: a fox that won’t sit properly because I made a mistake folding his bottom; a butterfly which resembles an aeroplane; and a tulip with a droopy head. The fox is for @raishimi, along with her favourite bottle of whiskey, for when we meet this weekend. I loved the rich context in which you situated your own attempts. I’m also glad you’ve added a new skill to your suite of talents. If there’s one thing I love about the human brain it’s that our neural nets–at once so rigid and so plastic–accept new nodes and branch out further. Even as old skills are brought to bear on novel acquisitions, our brains are using the new concepts to create other orders of understanding about our universe. Basically, this is why people who continue to learn into their twilight years suffer few of the degenerative effects of age–because their brains are constantly being “recreated”. Previous Post Can Micro-Fiction Ever have the Impact and Appeal of the Novel?